With a wild spirit and an open, loving heart, Peter C. McVeigh entered fully into every part of his life, believing in the power of human connection. Born to Joseph F. McVeigh and Margaret A. (Gould) McVeigh on April 14, 1946 in Chestnut Hill, PA, Peter died on February 7, 2017 in Abington, PA. In between he lived hard and well, loved his family and friends fiercely, and sent legions of students out into the world believing in their ability to change it. Peter attended Little Flower grammar school in Mount Airy, where he occasionally drove the nuns to distraction; LaSalle High School (1964), where he served as President of the Student Council and Salutatorian at his Commencement; Saint Joseph’s University (1968), where he led the Booster Club, championing the school motto, “the Hawk will never die,” and earned a B.A. in English. He then entered the Peace Corps, serving a rural village in Ethiopia, where he became what he was always meant to be…a teacher. After his return home, he earned his M.A. in Education at Temple University. 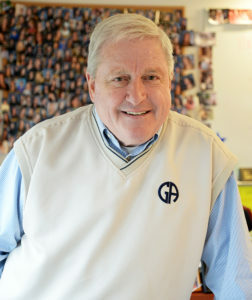 Hired in 1971 to teach fifth grade at Germantown Academy, Peter learned quickly that hanging wayward students out of second-story windows would facilitate his move to administrative positions like Director of Admission and then to Director of Community Service and Upper School History teacher. In these capacities, Peter shared many gifts with his students: his genuine passion for them and their concerns; his belief that they could make a difference in the world; his ability to laugh at himself and with…well truthfully…at them; and his willingness to ask questions, listen to answers, and revise his own thinking. Peter was able to be true to himself while he invited others to be true to themselves. To be a student in his history class was to be changed forever. As Director of Community Service, Peter transformed a meaningful extracurricular club into a school-wide phenomenon that provided opportunities for students of all ages to reach out and be of service to others. Under Peter’s guidance students organized and executed the Thanksgiving Food Drive, the Candy Cane Sale, Buddy Days, the Make-a-Wish Tournament, the Holiday Gift Drive, the first National High School Conference on Hunger and Homelessness, and another National High School Conference on Social Justice. Peter helped students make things happen, even when that was far more challenging than making them happen himself. The name Peter means “rock,” and so he was, one embedded firmly in the philosophical foundation of Germantown Academy, dependable and true. He approached his work with humor and humility, feeling blessed every day to come to his school, GA. Not surprisingly, Peter’s warm and straightforward demeanor naturally drew students and colleagues to him. His genuine concern and wise counsel made him a GA legend and brought him, unbidden, numerous awards and accolades among which are induction into the Class of 1760, the GA Athletic Hall of Fame, and the Academy Club; the first Mission Award; two yearbook dedications; several outstanding teacher awards; and most recently the dedication of the school’s new “McVeigh Community Room.” Thousands of students who worked with Peter in the classroom, on the field, in community service, and the Ethics Club attribute their choice of a life of service and activism to Peter’s influence. To all of them he served as beacon and lighthouse, teacher and friend. To understand Peter as teacher one need look no further than his family. There was no more important role for him than husband and father. Peter often attributed his success at school to the warm and unwavering support of his loving wife, JoAnn McKeever McVeigh, who predeceased him in 2008. He was devoted to her and she to him, and together they created a strong and loving family. Peter shared GA with all of his children, each a proud GA alum. We’ve all heard, “Nobody on his deathbed ever said, ‘I wish I had spent more time at the office.’” Nobody except of course Peter. Peter wove his personal and professional lives together so seamlessly that there was only the path that Peter walked. His children and now grandchildren are so much a part of the fabric of GA and his students and colleagues woven so tightly into the fabric of his family that it is all one. Some will argue that this is not a good thing…and for some I would agree…but this was Peter…so time “at the office” was never time to be discounted as unimportant. His work was not separate from the man. Family was his life, and his life was his work, and it was all one. Peter leaves behind a proud family, including three devoted children and their spouses: Ian J. McVeigh (Denise), Meghan McVeigh Maciolek (Joshua), and Brendan M. McVeigh (Theresa). He also leaves four adoring grandchildren: Jake Diorio McVeigh, Anna Margaret McVeigh, Stella JoAnn Maciolek, and John Stephen Maciolek. Additionally, he leaves six siblings: J. Kevin McVeigh (Ginger Carson), Jane McVeigh-Schultz (David), Maggie McVeigh (Stephen Kennedy), John S. McVeigh (Karen), Christina M. McVeigh, and Christopher K. McVeigh (Holley Pokora). Peter was predeceased by his dear sister Kathleen P. McVeigh. Peter’s ten nephews and nieces will miss the harbor of their uncle’s love, humor, and non-judgmental counsel: Joshua McVeigh-Schultz, Jody McVeigh-Schultz, Ryan Pirtle-McVeigh, Kathleen Susanne McVeigh, Will McVeigh Kennedy, Kelly McVeigh, Michael McVeigh, Stephen McVeigh, Noah McVeigh Kennedy, and Kalin McVeigh Carlino. Relatives and friends are invited to Peter’s viewing Friday 2/17, 5pm to 9pm, the Field House at Germantown Academy 340 Morris Rd., Fort Washington, PA 19034, and his Memorial Service Saturday 2/18, 12:30pm at the Field House. Interment Private. In lieu of flowers contributions in Peters name may be made to Germantown Academy, Community Service Organization, 340 Morris Rd., Fort Washington, PA 19034, St. John’s Hospice, 1221 Race St., Phila, PA 19107, Project Home, 1515 Fairmount Ave., Phila., PA 19130, Face to Face, 109 E. Price St., Phila., PA 19144, Silver Springs Home, and St. Mary’s Hospice. My prayers & condolences to Peter’s children & siblings! While I hadn’t seen Pete in years, we went to grade school together at St. Therese in Mount Airy & I have wonderful memories of Peter & those early days. His obituary & life story are truly inspiring! What an incredibly great man he was. Know of special prayers for Peter & for all of you! My brother Peter left a legacy that is staggering. Maggie, our sister, captures that legacy as well as Peter’s humor, dedication, and brave heart. He never missed an opportunity to challenge the status quo or the complacency of privilege. Peter pushed students to examine their values and move in the direction of justice and compassion. I am awed by the bravery of Peter’s children, and the delight and love they and his grandchildren and students felt for him. There have been floods of messages. So many convey the sense that Peter changed lives, one student at a time and that he taught others to take responsibility for righting inequity, for acting with courage and living beyond ego and selfishness. He was a hero who made everyday heroism seem not only possible, but necessary. I love you, brother. My sincere condolences to all of Peter’s family. He was a truly inspirational part of Germantown Academy, the likes of him will never be seen again. Thanks to his family for sharing him with all of us. Peter, may you rest in peace as Jesus receives you into his loving arms. Peter, you have been a good, wise, fun friend to my family. Thank you for being there for my granddaughter and also for my kids at our time of loss. You will always be remembered and appreciated. God Bless you. We never miss a friend, They become part of Our being. As the class of ’68 at St Joe’s prepares for the 50th anniversary celebration of our graduation, we are deeply saddened we will not be joined by our friend and colleague Peter Campion Mc Veigh. fondly remembered by his classmates.